When I first started teaching in the Faculty of Education, I wanted to design my course (I teach the educational technology course) to meet the needs of my students; teacher candidates in Manitoba. The province was also implementing a new initiative called "Literacy with ICT", which called for teachers to infuse ICT into their classrooms. There was, of course, much written in popular literature about Gen Y, or the 'digital natives', this was useful for motivating and inspiring teachers to change, but was it true? What was the actual competency and knowledge about ICT that my students brought to the program? There was also some suggestion that the ed. Tech course be discontinued and that ICT be part of other courses, after all, the students were all "tech-savvy". Glenn and I decided to investigate what our student's actually used technology for, and how they saw themselves in terms of competency in certain areas. 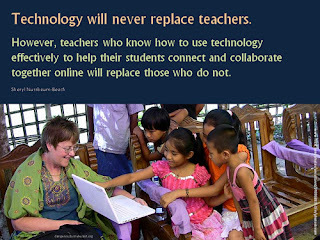 The major thing I take from our results so far (year 1 of a planned 3 year study) is that GenY is overgeneralized and, while they do exhibit a high degree of comfort with technology, there is such a wide variation and depth of skill, that assuming that our students are ready to wisely and effectively integrate ICT into their teaching is a dangerous premise. If we expect teachers to make effective and thoughtful use of ICTs in teaching and learning in a pedagogically sound way, then we can not simply assume they have a wealth of knowledge about technology and send them on their way. Our results indicate differences, not only in generations, but in gender. No doubt a person's interests and background play an important role in technology use as well. If we assume our students are as knowledgeable and savvy as the popular literature says, then we risk leaving some behind, add barriers to learning of others and gloss over vital concepts. Good teachers take into account individual differences and needs as much as possible, this applies to ICT skills as well as learning preferences.